WHEELS: All Skateboard wheels are made from Polyurethane. It's durability and resistance to abrasion made them perfect for skateboarding. 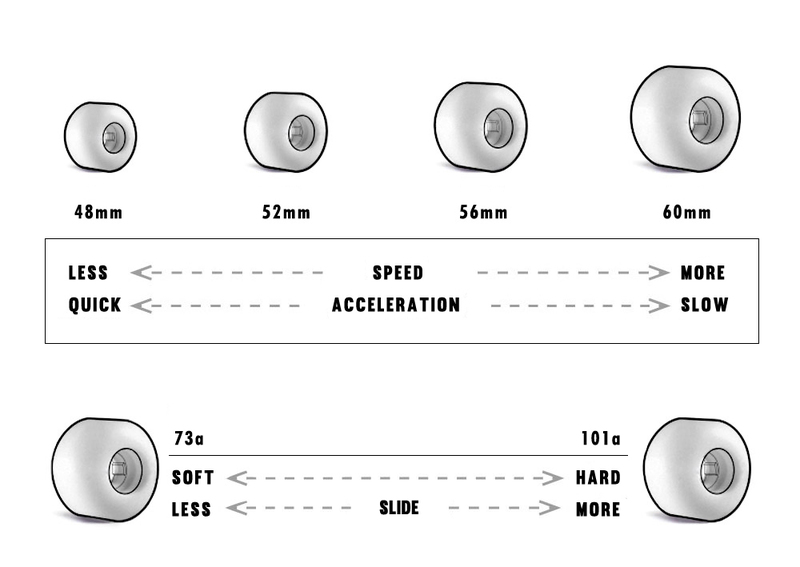 There are many different types of wheels, but the most important thing to choose our wheels but the 2 most important things to consider are the diameter and the durometer. DIAMETER : Diameter is always measured in mm. Normally the size range is from 49mm to 75mm. 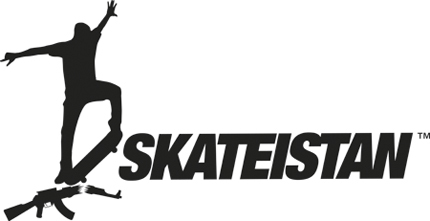 Smaller wheels are the choice for street skaters, as they reduce the height of the skateboard giving more stability for doing flip tricks. Larger wheels are the choice, for the ones who want to skate transitions or cruising. DUROMETER : The durometer will determinate how much grip the wheel has, and also its shock absorber capacity. Soft wheels are compressed when pressure is applied on it, giving it more grip and allowing it to absorb more shock. Harder wheels will barely compress under pressure, giving it less grip, and less shock absorption, but harder ones are preferred by most transition and street skaters for their responsiveness. Durometer is measured using the scale A. This ranking system have a number followed by the letter A. Larger numbers means a higher durometer, so harder wheels. 101A will be a very hard wheel while a 75A a really soft one. Bones Wheels, uses the scale B to messure the Durometer of the hardes wheels. the B scale reads 20 values below the A scale. Resume: If you want to skate the streets, smaller wheels will be the best choice, if you are looking to skate transitions, a higher diameter will be better, but if you are starting, we recommend you a size between. In all options, we recommend you a 98A to 101A durometer.